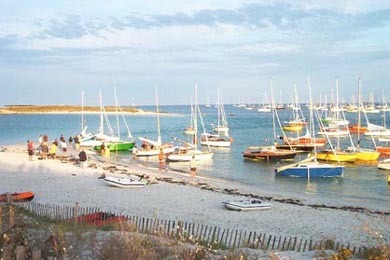 After the creation of the Nautical Center of Glénan, it was necessary to find boats for the trainees. The market offering nothing which was at the same time strong, cheap, of easy and convenient interview (maintenance) of use, Jean-Jacques Herbulot decided to build boats in plywood on the bases of an original concept: use the rigidity of the material of the hull (shell) instead of the traditional structure established (constituted) by ribs and by skittle. After the explosive success of the first boat of this type (chap), the Vaurien, the architect thought of endowing the CNG of a boat of initiation into the coastal cruise and it was the birth of the Corsaire drawn in 1953. The Corsaire n°1 is launched to Concarneau in 1954 and receive in the CNG in the enthusiasm. The success is immediate and the construction sites (works) of manufacturing of the Corsaire multiply. Nowadays the Corsaire it against traditional plated jewellery and it against epoxy plated jewellery is always built. In 1972, JJ Herbulot begins (undertakes) the drawing of a cloth Glass Corsaire and a polyester the hull (shell) of which is identical to those of the wooden boats; elements are conceived (designed) to be able to be turned out then assembled. This type (chap) of construction remains relevant and since 2005 he is produced with a bridge(deck) » version 1954 « . In 1975, the architect publishes the plans for the construction in the unity(unit). It is that we called the Construction Amateur who is made on partitions beforehand organized(been organized) and not on wooden mold. The Guide of Construction, aimed by the architect and at present spread(broadcasted) by Ascorsaire show supporting photos, how we take ourselves there. When builds up himself in England the Offshore Junior Group gathering small boats for the race in open sea, JJ Herbulot adapts the Privateer to the rules of the JOG. He allowed the discovery of the sea and his laws by the largest number and that is why it became a mythical boat. His(Her) followers appreciate(estimate) him(it) indifferently in cruise and in regatta. Every year, Corsairistes meets to go(surrender) to squadron on the scene of the National or during cruises abroad. Key regatta annual of the series are the Cup(Cutting) of River (in May 1st), Myth of Malham Cup and National Open Corsaire (at the beginning of August). On the international level of numerous French Corsairistes also participates in Swiss’s championship or in Régatissima ( Ascension Day). We celebrated with dignity the sixtieth birthday(anniversary) of the Privateer in 2014 to Carantec during the National which gathered(combined) 66 Corsairistes. Nous avons fêté dignement le soixantième anniversaire du Corsaire en 2014 à Carantec lors du National qui a réuni 66 Corsairistes.